If you had asked me a year ago where I'd be at this point in my life, I don't think I would have had any idea that I'd be the co-owner of a 1960s split level in Pittsburgh. Nor would I have guessed that I'd be spending this summer away from my husband, living in my younger sister's college apartment and wishing the days away. It will most definitely be difficult to leave our friends and family in Virginia. It's been a wonderful 6 years in Charlottesville. The last two have been a bit more challenging, adjusting to life outside of the University, grappling with my career choice, and transitioning into a different part of the community. The truth is that the longer I've been living here, the smaller this place has become and the more I've been craving the bustle of a larger city. When Alex applied for a job in Pittsburgh, neither of us had ever been. Honestly, the thought of living there had never even crossed my mind until Alex started to express interest in going back to graduate school at a place like Carnegie Mellon. Though the weather seems to be all that I imagined (very gray), the city itself has experienced a major revitalization in recent years. It seems to offer all of the amenities I've been wishing for. I'm beyond excited to introduce you to our first home in the North Hills area. T-20 days until I can really start to make it our own. Most of these photos are ones that I took during our home inspection and depict remnants of the previous owners' decor. The exterior shots are from the MLS listing. 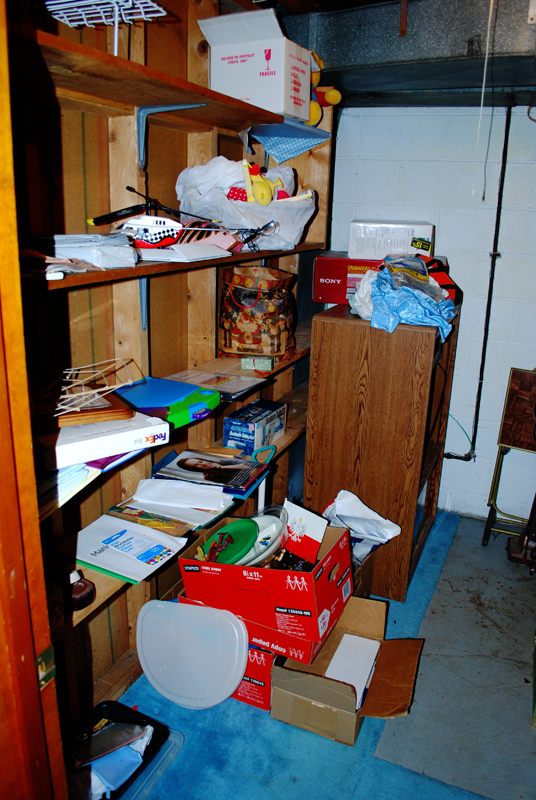 We have since closed and started unpacking our own things. I hope to post progress pictures once I move up in August. For now, enjoy. All my life, I've longed for a house completely unlike this one. I've adored old homes... more specifically, turn-of-the-century old homes. High ceilings, beautiful banisters, butler pantries, fireplaces, and clawfoot tubs...sigh. They make my heart skip. Not long after we got married though, I had a very vivid dream about searching for house. 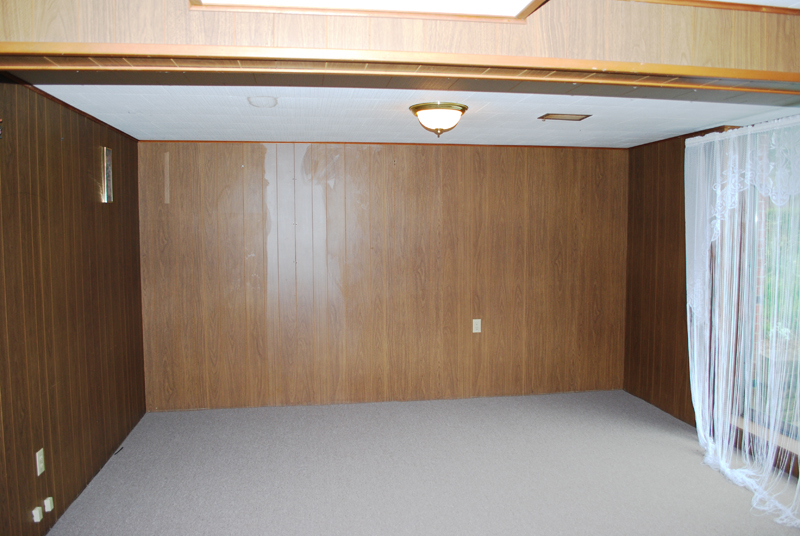 We toured a 1960s split level with a hip roof just like this one. I knew I had my heart set on an older home but was surprised by how much I liked it. When I woke up, I drew a picture of the house and shared it with Alex. That dream was in the back of my mind as we began looking for a new home. I knew that if I found that home, it was destiny. Because of that and my design experience, our house hunting process was QUICK. I knew that I would be able to see the potential in almost anything so I intentionally limited our scope. We saw 6 houses in one day and put an offer on the first one we looked at. As an aside, I think it really confused our realtor that we weren't looking for a move-in ready property. I had explained to her that it was my dream to renovate an old home. I even said "the crappier, the better." Still, she sent us 8 listings to preview and I told her 6 of them were way too nice. 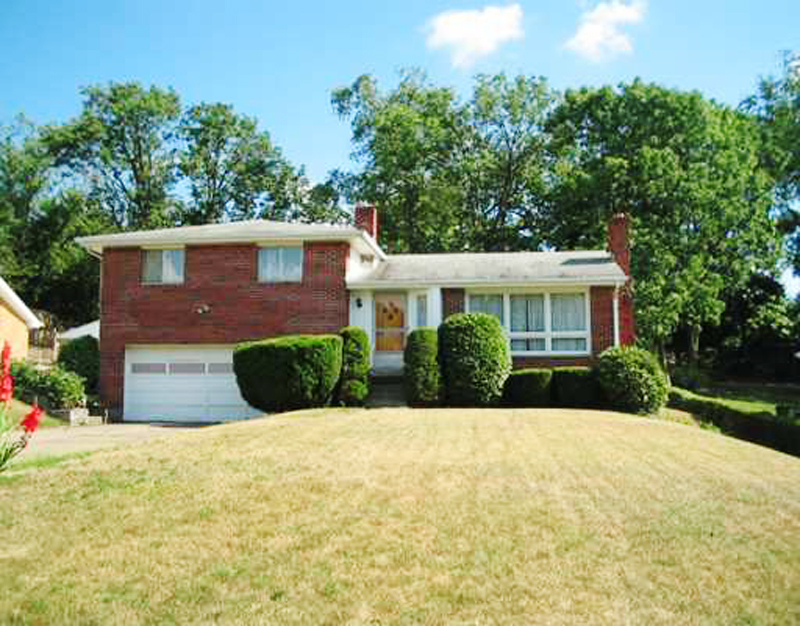 After a brief love affair with another 100-year-old property on the Ohio River, we chose this property because of its well-maintained condition, mid-century style, quiet neighborhood, size, and investment potential. 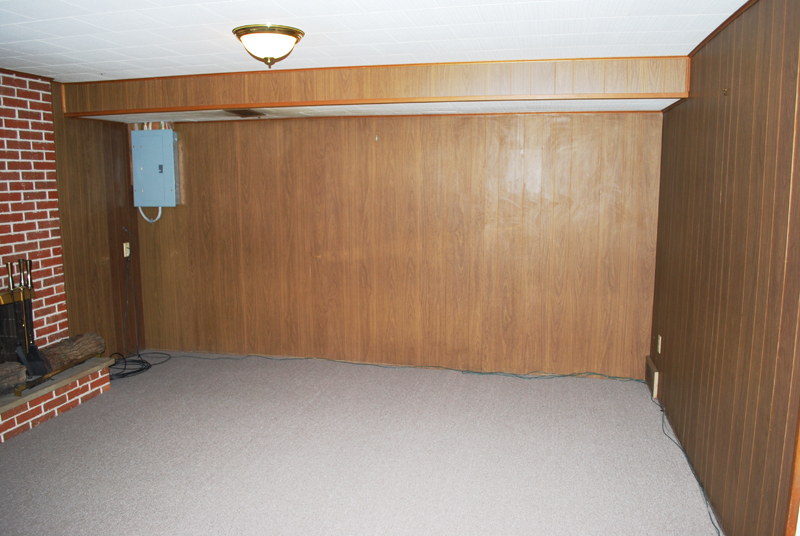 It's a 3 bedroom, 2 bath (plus "Pittsburgh potty") split level built in 1963. The backyard is incredible (minus the ugly clothesline and giant pile of sticks). I hope to expand the patio someday soon. This is the living room. As soon as the house was officially ours, I ripped that doily off of the fireplace mantle. We also just recently refinished the floors. More on that later. Some of the more intriguing architectural details of the house exist in the entryway. I'm not quite sure what to make of this awkward angled window. The planter, unfortunately, has already met its maker. If my architectural detective skills are up to par, I believe this was once connected to a railing which separated the living room from the entry. Without the railing, the planter was more of a tripping hazard than an effective spatial divider. 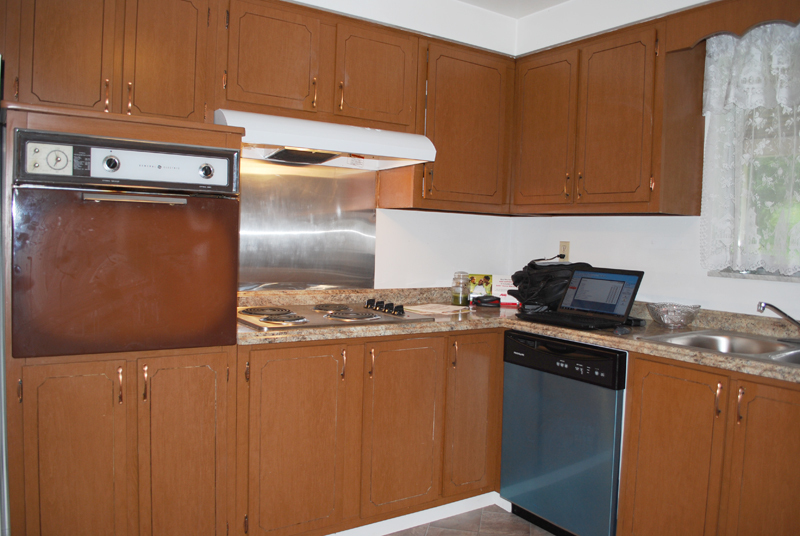 Eat-in kitchen with recently replaced dishwasher, cooktop, and countertop. We're hoping to redo the whole thing come spring. 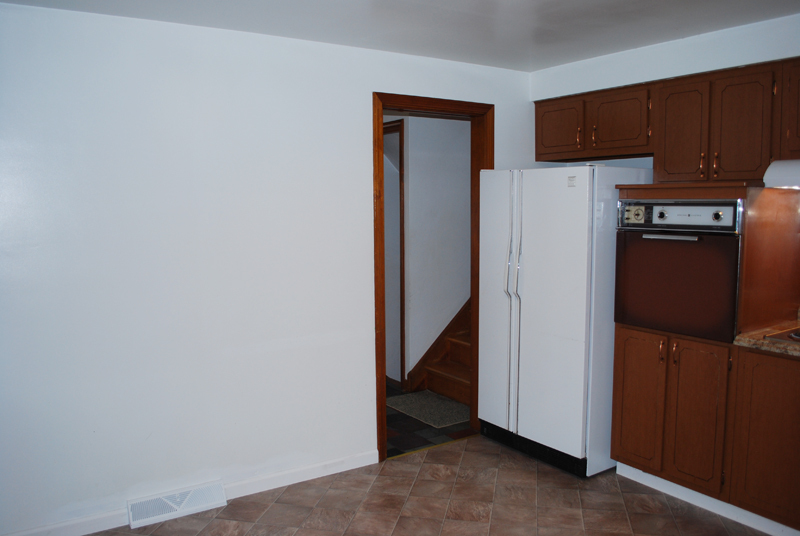 Does anyone want dibs on that vintage wall oven? The hall bath and only bathtub in the house. What's a 1960s house without a turquoise bathroom? It feels like home to me. I apologize for the lack of spatial description in this photo. 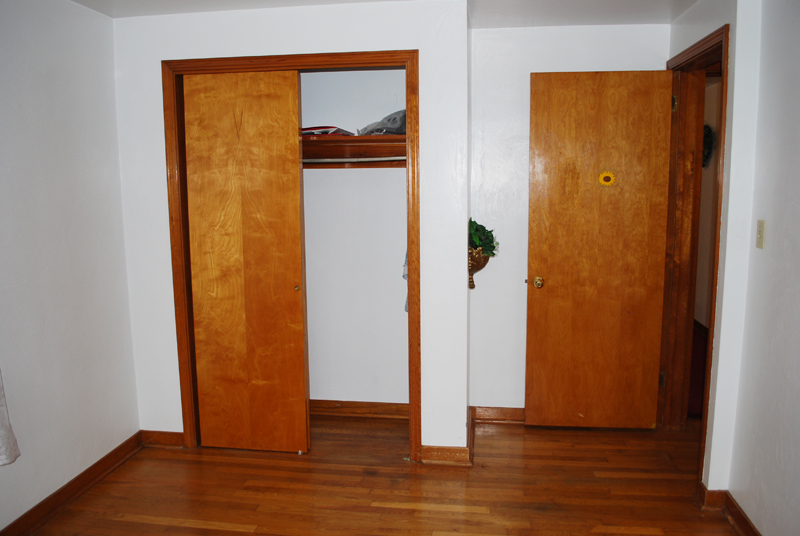 This is the smallest bedroom, which I currently refer to as the "sewing room." This is the master bedroom. The red carpet is long gone at this point. Perhaps the smallest master bathroom I have seen to date. 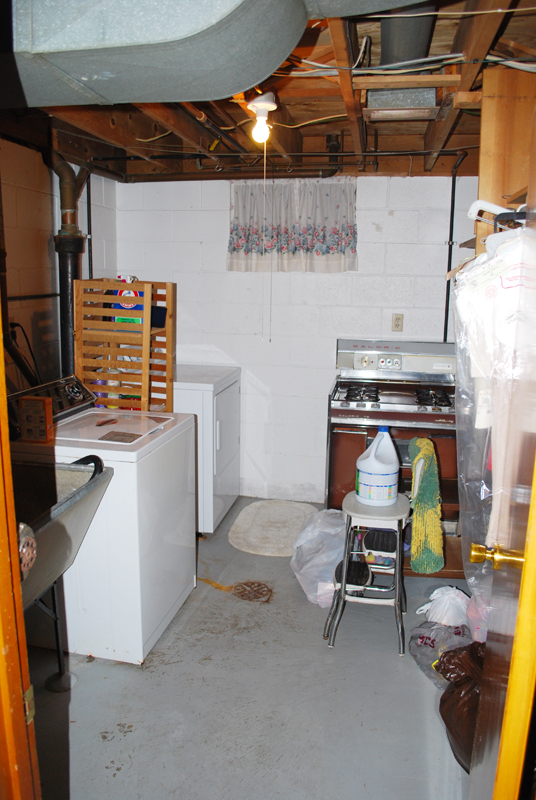 Laundry in the basement, complete with all the essentials - washer, dryer, sink, and gas stove? Much to our surprise, it's actually connected to the gas line and ready to use. Utility room plus extra storage. 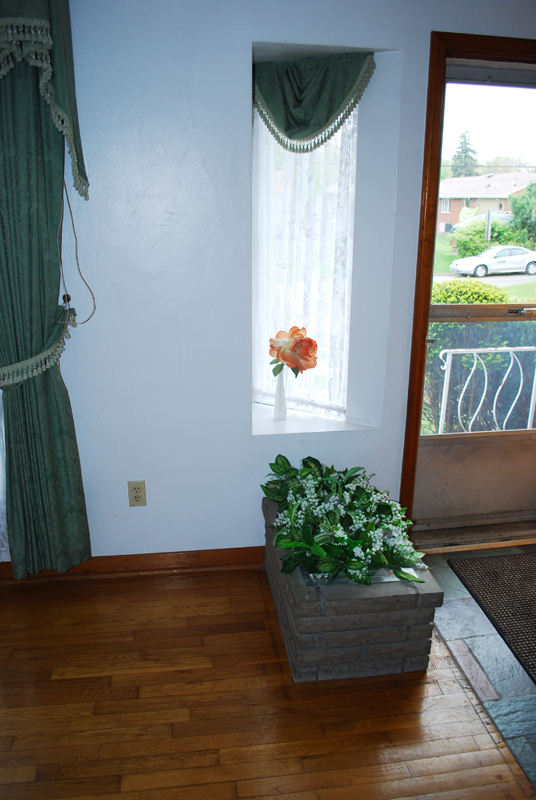 The left side of the walk-out basement, featuring a highly coveted flapper-style lace window treatment. The right side with fireplace and attractive electrical panel. A better view of the fireplace which I hope to paint (along with the paneling) and flank with bookcases. Last but not least, the garage. I unfortunately forgot to document the Pittsburgh potty. For those who are unfamiliar, a Pittsburgh potty is a toilet and/or sink and/or shower in the garage or basement. Sometimes they are hidden behind doors (like ours) and sometimes not. We were told by our home inspector that they were for steel or coal workers to use to wash up before coming in the house. I'll have to post pictures of that later. Now, if only I could stop daydreaming about all of my design plans and focus a bit more on my actual work...More updates later.